Can a person be addicted to Amazon deliveries because I think I am. It’s so easy to sit and peruse Amazon while the boys are napping. And before I know it, I’ve made a purchase. Usually it’s nothing expensive. Almost always it’s a book. But I have noticed when the delivery man makes a delivery, I’m a little let down when it’s not for me. I’m working on breaking this habit of the thrill I get when the package arrives. Does anyone else have this problem or am I a lone wolf? PS I don’t randomly order from other sites, nor do I go shopping much. It’s just Amazon. According to the internet there are six billion texts and 100 billions emails sent every day. Personal, handwritten letters are almost extinct. When I searched online for how many letters are sent everyday all I could find were estimates from several years ago and it was for total pieces of mail. The number was about 700 million which would include advertisements, bills and just general junk mail. So there is no definitive answer to how many personal letters are sent daily. Should it matter how you communicate as long as you communicate with those you love? Speed would be the primary argument in favor of a text. You write it. You hit send. And the message is almost instantaneously received on the other end. Argument for e-mail is that it allows a time trail of communication with each email sent being time and date stamped. So aren’t those methods the best? Don’t they make the most sense? If you are trying to send a simple message, then yes, those methods work. 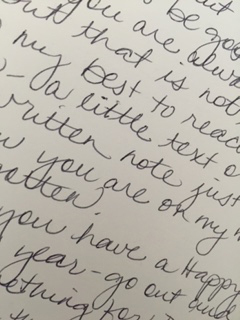 But I was thinking about the importance of a handwritten note or letter and why it has so much more significance. First it takes time and effort to hand write a note, then address an envelope, stamp it and mail it. So just the very act of doing it says to the receiver you care. Second meaning can be carried in the handwriting itself. Handwriting is personal. Everyone has a slightly different style. And over time a recipient can see changes in the writing. Does your mother’s hand look weaker than normal? Is your friend stressing certain words differently? Next, a note or letter can carry the scent of the person who wrote it. We’ve all heard of the perfume scented letter but what about one that has the scent of smoked wood, or vanilla or anything that leaves a personal mark. It creates a sense of being closer when you are aware of the scent of the sender. And if we only communicate by text and email, when we are gone from this world what will remain of us? How will future generations know we loved our family and friends? What written evidence will be left? Certainly not our texts and emails. So take a chance. Go buy some inexpensive note cards (they usually don’t allow a lot of room for writing so the sender doesn’t feel overwhelmed by the need to fill the page), buy some stamps, compile a list of five friends or family members and write them a short note. Make it a habit. When I receive a note or letter in my mailbox among the bills or junk, it completely brightens my day and all for under $1.